Research literary and non-literary topics using electronic and print sources. Also offers citation guidelines. Would you like a real-time demonstration of how to search GALILEO, GIL, or specific databases? Learn to find online resources about literature topics including author biographies, literary criticism/analysis, and literature movements. Includes recommended databases and search tips specific to literature topics. 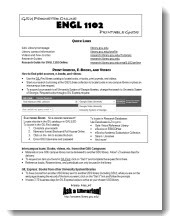 L earn where and how to find information for ENGL 1102 research assignments. Take this ungraded, 5-question quiz to check for understanding.